A small - but growing - group of experts think world oil production will peak in the next few years, to devastating effect. NEW YORK (CNNMoney.com) -- At some point in the near future, worldwide oil production will peak, then decline rapidly, causing depression-like conditions or even the starvation of billions across the globe. That's the worst-case scenario for subscribers to the "peak oil" theory, who generally believe oil production has either topped out or will do so in the next couple of years. A small but growing group of experts think oil production will peak in the next few years, then decline rapidly. The result could be worse than the Great Depression. What follows depends on who one talks to, but predictions run the gamut from the disaster scenario described above to merely oil prices in the $200-a-barrel range while society transitions to other energy sources. It's not a view held by most industry experts, including the oil companies, the government and most analysts at the financial houses. But its adherents are growing, and include some fairly well-known names. In the coming week, a former chairman of oil giant Royal Dutch Shell (Charts) is speaking at a peak oil conference in Ireland, as is former U.S. Energy Secretary James Schlesinger. Most peak-oil proponents simply don't believe the numbers put forward by industry and the government. The world will produce 118 million barrels of oil a day, up from its current 85 million barrels per day, just to satisfy projected demand by 2030, according to the Energy Information Agency. "That's never going to happen," said Richard Heinberg, a research fellow at the Post Carbon Institute and author of three books on peak oil. Heinberg says world production of regular crude oil actually peaked in May 2005. He also says production in 33 of the 48 largest oil producing countries is in decline, and that global oil discoveries peaked in 1964. Most importantly, he says reserves in the Middle East, where EIA predicts the bulk of new supply will come from, have been "systematically overstated." "Everyone just takes their figures at face value," Heinberg said. "But they are national oil companies, they can't be audited." Instead of production ramping up to 118 million barrels per day, Heinberg sees a plateau over the next few years, then gradual declines beginning in 2010. By 2015, he says the rate of decline will accelerate as field after field runs dry and few new supplies are found. By 2030, the world could be looking at powering its economy on 30 million barrels a day. "It's going to be an enormous shock to the global system," said Heinberg. "We're talking something on the order of the Great Depression, perhaps much worse." As for billions starving to death when crops dependent on fossil fuel-based fertilizers fail en masse, he said, "that's the worst case scenario, but it can't be ruled out." Indeed, Web sites devoted to peak oil sell numerous survival-style books seemingly geared toward a society in which, at the very least, the basic economic infrastructure has broken down - if there's not total anarchy. From the Web site lifeaftertheoilcrash.net, titles include "Gardening When it Counts: Growing Food in Hard Times" and "Crisis Preparedness Handbook: A Comprehensive Guide to Home Storage and Physical Survival." "It's fear mongering, sensationalist crap," said Fadel Gheit, a senior energy analyst at Oppenheimer. Gheit says there's plenty of oil out there, it just needs to get to a price where it's profitable to extract. "We have so far consumed one trillion barrels" in all of history, he said, pointing to a 2000 study from the U.S. Geological Survey that made predictions based on rising prices, technology advances and assumed new discoveries based on past finds. "There are three trillion more to go." He said proven oil reserves - the ones oil companies believe they can extract with today's technology at current prices - have increased every year for the last 30 years. A lot of the new oil will come from existing fields, said Gheit. 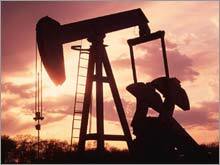 He said oil companies have never extracted more than 30 or 40 percent of the oil in any given field. It just became too expensive to continue drilling there, so the companies moved on to new areas. "The free market is working," he said. "With higher prices, there will be incentive for companies to develop new technology" to extract the remaining oil. Industry executives also downplay the peak oil theory. "Similar predictions were made in 1914, in 1939, in 1951, when post-war demand was on the rise, and again in the 1970s," Exxon Mobil (Charts, Fortune 500) head Rex Tillerson was quoted saying in the Calgary Sun in 2005. "These predictions were always proven wrong." But whether oil production peaks or not, by pushing crude prices up more than eightfold over the last 10 years, traders clearly believe supplies will strain to keep up with demand. "Growth in the developing world is just too great," said Stephen Leeb, an investment manager who has authored two books on oil scarcity, the last one predicting $200-a-barrel oil in the next 5 to 10 years. "Demand for oil will outstrip supply."